Thinking about her while hoping and praying she’s thinking about you? Yeah, you’re a goner. The general consensus around these parts is that falling in love happens gradually, over time. Instead of one glorious moment with violins in the background, you cross a series of hurdles together—and with each one, you become a little more sure. 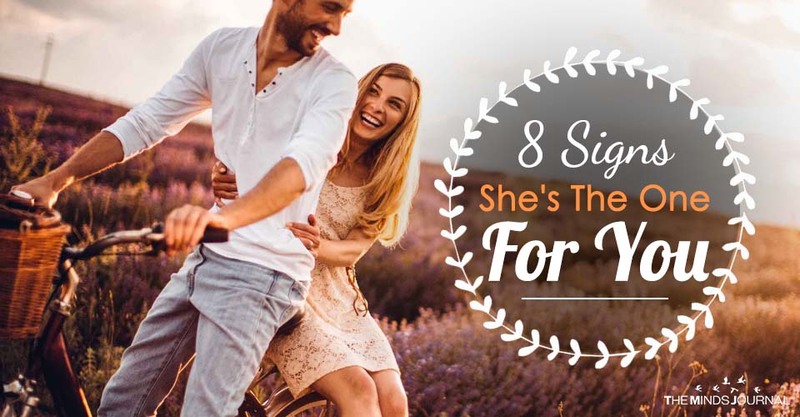 If you’re trying to figure out whether it’s love you’re feeling, here are 8 signs that those three little words might just be in order. of losing her, of keeping her, of never being with another woman… the list goes on and on. Are you ready for all this? What if it crashes and burns like your last relationship? Wait, how did you let this happen again? Yet deep down, you know you’re going for it anyway. 2. You’ll do whatever it takes to impress her. “You want to go eat at the vegetarian restaurant? Sure.” “And salsa dance afterward? Why not?” When you’re willing to bend your own rules, try new things, and go the extra mile for her—like walking her fluffy, little dog when she’s sick or helping her move when you should be watching the game—chances are, it’s that crazy little thing called love. This line from “Over My Head” by The Fray pretty much sums it up. She comes into your thoughts constantly: “Amber would love this restaurant,” “I wonder what she’s doing?” or “What can I text her without sounding too sprung?” You want her to be thinking of you too, of course, so you make up little excuses to call and say hi. 4. She makes you want to be a better man. The stakes are high when you meet a woman that blows your mind. You become more serious and focused about getting your act together and fixing your money situation or hitting the gym. Things that used to dominate your mind just aren’t as important anymore. Yes, the Cubs just lost, (and they better get it together by next season, or you will personally be attending spring training to “strongly encourage” them,) but the sting isn’t quite as bad with her sitting next to you. Besides, her rubbing your shoulder might even make it worth it. 5. You just want her to be happy. It’s not just about you anymore. When her boss is working her to death, you help her figure out what to say. If she’s sick, you’re at the store buying soup and crackers. After she gets in a fight with her sister—even though you may have no idea what the fight was really about—you distract her so she can get back to her usual self.